Most projectors are now HD-ready, but owning something superior to what your neighbours have is a strong human instinct, so there's now Full HD for those who favour Club class quality over Economy. So it's no surprise the VP11 S1 costs 10 grand. Yes, ten. So how much extra legroom do we get? The VP-11 S1 isn't completely alone in hallowed HD projector territory. Sim2 has its Domino, JVC its HD1, and Sony the Ruby, which indie-pop sensations Kaiser Chiefs regularly sing the praises of. Different companies use different technologies to attain this standard. LCD, D-ILA and SXRD are the alternatives to the DLP used by Marantz - not just acronyms with which to bore people down at the pub. 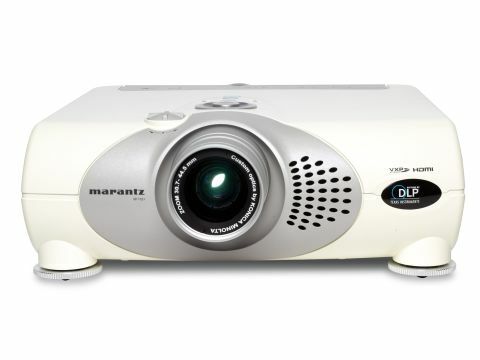 But Marantz has an established history with DLP projectors. For the price, you might expect three chips but the Konica Minolta optics are versatile. The single chip VP-11 S1, therefore, promises to be a polished diamond without resorting to the compromises or inconveniences of scaling or cropping of its pictures. Its hefty aluminium body is built to minimise vibration and running noise and its bulk suggest its permanent home should be above your head. Connections include two HDMIs, twin component video inputs and one for a PC. Set up is made easier with a back-lit remote control and an excellent onscreen interface. Features include manual zoom and focus, digital keystone correction and optical lens shift. Pictures can balloon out to 250 inches. Even next to a 9ft screen, it's hard to see the pixel structure and we saw neither jaggies nor pixel blocking, let alone evidence of ageing on Leonardo Dicaprio's face. High-def material looks stunning. It upscales all images to 1080p, but if you feed in this source directly you get some idea of where the money's going. Contrast is excellent although it struggles slightly with pure black as DLP is wont to do. The colour wheel has been extended to seven segments to squeeze out more vivid colours, with an extension of the usually hard-to-reproduce red part. The result is a big improvement on past models. Standard-def material also looked smooth and sharp, which is a bonus as you'll still be watching a lot of it. Overall an awesome if pricey high-flyer.